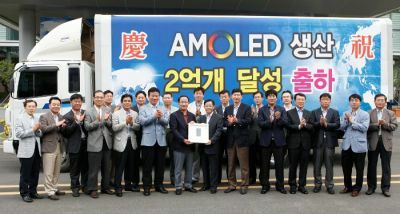 Samsung has produced AMOLEDs at an average of over 100,000 panels a day. But their capacity is growing quickly: it took them four years and five months to produce the first 100 million panels and just 11 months to produce another 100 million panels! Samsung Youm amoled on flexible polyamide substrate and 0,27mm. Hopefully will Samsung Mobile Display not make the Youm flexible amoled displays in only 10"
because Youm flexible amoled displays in larger sizes will have a huge market to. Forthcoming years will tablet pc come in larger sizes and why not in 20"? On Youtube you can find Samsung Youm amoled in 4,5" and it only weigh 2,1gram,that is another desirable property in displays for wearable computers. Amoled on flexible substrate which is on amorf polyamide have an very interesting property because amorf polyamide is transparent by it self.So, forthcoming flexible amoled displays can be partially or totally transparent when no current is on subpixels or pixels on the flexible amoled display. Flexible amoled displays on amorf polyamide substrate is also very thin in Samsung Youm displays, only 0,27mm. thin together with Stanford University researchers innovative transprent Li-ion battery can have new very interesting properties if this will be mixed.